Speed, power and durability are key characteristics of industrial robots. These robots are typically used in applications such as welding or in lifting heavy components for vehicle assembly. Yet despite advanced calibration methods, the position accuracy of industrial robots has been inadequate for certain tasks. This is now changing thanks in part to highly accurate, output-side encoders from HEIDENHAIN and AMO. The main driver behind this development has been the aerospace industry because it must perform highly accurate machining operations on very large components. Machine tools would achieve the required level of accuracy with ease but are either too inflexible or too expensive as special-purpose machines for the job sites and working spaces involved. A robot, however, can easily reach any position on a very large component, such as the fuselage of an aircraft, and can perform tasks on it such as drilling and milling. In order to achieve the desired level of maneuverability, robots with serial kinematics are required, such as articulated robots with six axes. Each one of these axes is driven by a servo motor with a gear train. Zero position error, backlash, and joint elasticities are the main sources of inaccuracy. Applied forces and dynamic effects during the machining process affect the rigidity of the robot’s mechanics and negatively influence the absolute position accuracy. Thanks to advanced calibration methods, it is already possible to move a tool center point to a certain position repeatedly to within several hundredths of a millimeter. Depending on the manufacturer, the repeatability of articulated robots as per ISO 9283 is ±0.1 mm or better. However, when compared with repeatability, the absolute position accuracy that can be achieved within the robot’s coordinate system is worse by a factor of ten. Depending on their design, maximum range, and maximum load capacity, articulated robots currently achieve an absolute position accuracy of ±1 mm. This is insufficient for meeting the accuracy requirements of industries such as the aerospace sector. Yet robot manufacturers have been responding to this problem. Classic rotary encoders continue to provide the servo motor feedback at the robot’s axes. Because servo motors require high control dynamics, the robust inductive rotary encoders from HEIDENHAIN, such as those of the ECI 1100 and 1300 series, or multiturn models of the EQI 110 and 1300 series, are ideal for this type of application. These encoders deliver high control quality and system accuracy, and they are resistant to strong vibrations. Since these encoders feature a purely serial EnDat interface, even applications exposed to strong electromagnetic interference do not impair data transfer quality or safety. These inductive rotary encoders support safety integrity level SIL 2, category 3 PL d. They can even attain SIL 3, or category 4 PL e, if additional measures are taken on the control. These encoders also provided the added safety advantage of mechanical fault exclusion against the loosening of the shaft and stator connection. With this safety package, these inductive rotary encoders can also be used in systems designed for human-robot collaboration. 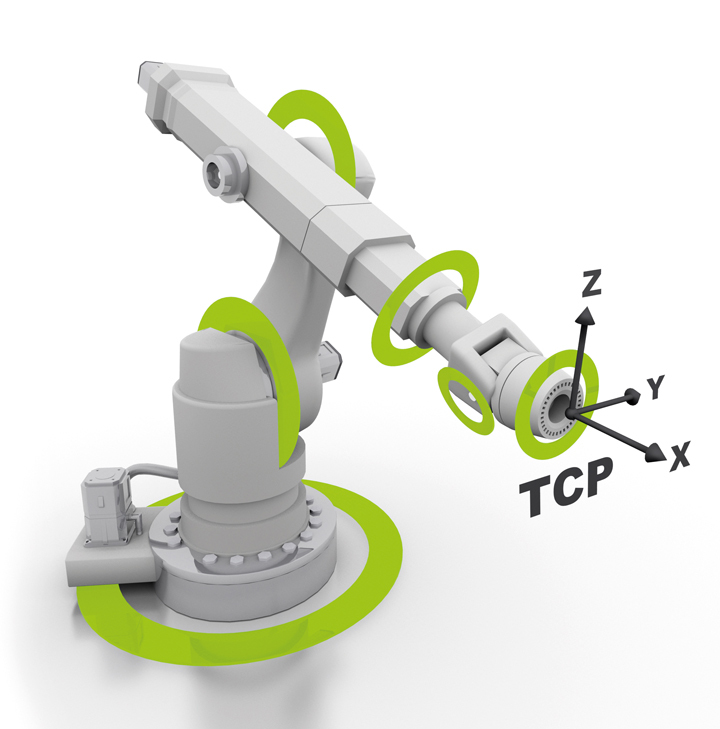 Robotics manufacturers can significantly improve the absolute position accuracy of their robots by using additional, high-accuracy angle encoders or rotary encoders at every robot axis. These so-called secondary encoders, which are mounted after each gear train, capture the actual position of every robot joint. This allows the encoders to account for zero position error and backlash. The retroactive forces on each axis resulting from the machining task are measured as well. All of this results in a 70 to 80 percent improvement of the absolute position accuracy at the tool center point. 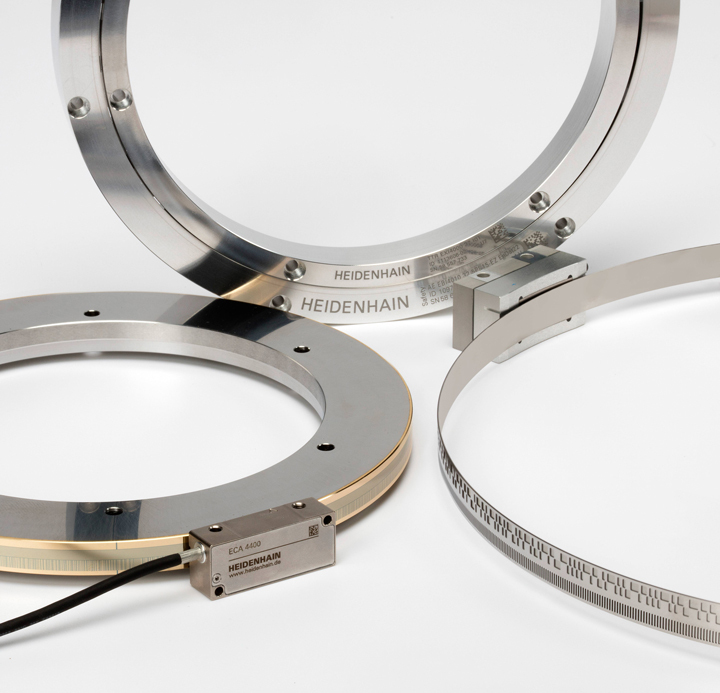 Modular angle encoders, such as the HEIDENHAIN ECA 4000 with optical scanning, the HEIDENHAIN ECI 4000 rotary encoder with inductive scanning, and the AMO WMR angle encoder, are well-suited for these applications. 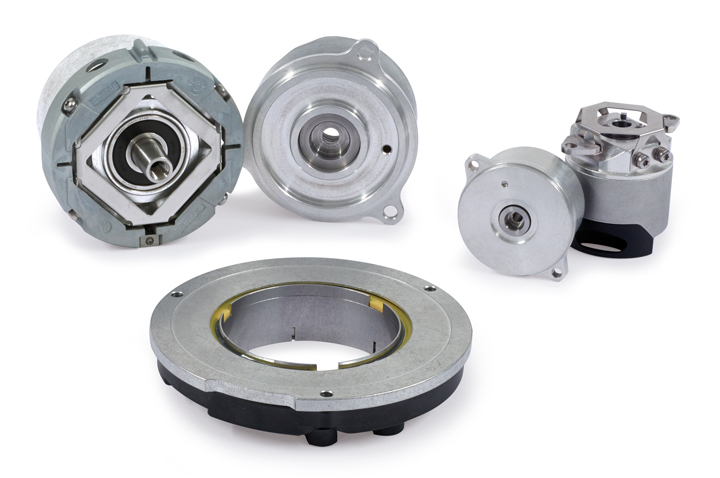 Thanks to their modular design with a scale drum or scale tape and a separate scanning unit, these encoders are well suited for large hollow-shaft diameters and for the challenging installation requirements often encountered in robots due to space constraints. The signal quality of these secondary encoders is considerably better than that of the rotary encoders on the servo motor, meaning that the returned position values are significantly more accurate—even for highly dynamic movements. In order to reach all of the machining positions on very large or long components, such as an aircraft fuselage or for manufacturing large composite fiber components, robots can be moved along the length of the component on linear axes. 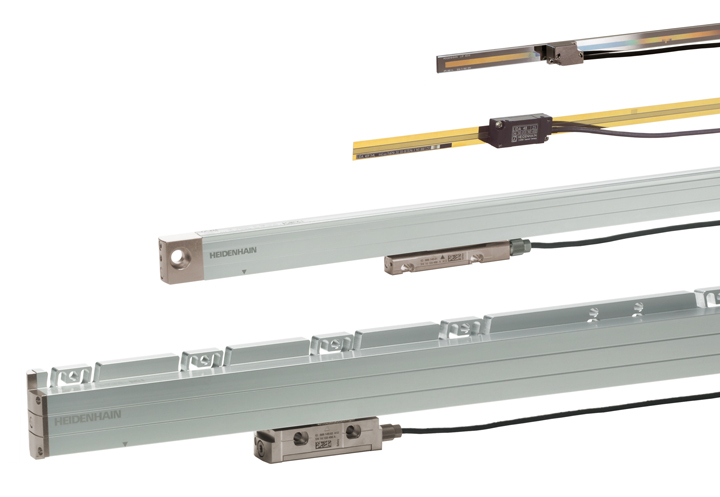 For the highly accurate positioning of robots with a linear drive, enclosed linear encoders from HEIDENHAIN are available in lengths of up to 30 m. Position measurement from a linear encoder compensates for thermal errors and other factors that influence the feed mechanisms. These factors cannot be captured by means of conventional position detection methods based on the pitch of the recirculating ball screw and the angular position of the rotary encoder on the motor. The use of secondary encoders on all of a robot’s axes, as well as the use of linear encoders for positioning the robot relative to the workpiece, enables a level of accuracy at the tool center point that allows appropriately equipped industrial robots to perform positionally accurate machining and handling tasks on components. Angle and linear encoders from HEIDENHAIN and AMO offer not only the required system accuracy but also the necessary flexibility for installation in complex and compact robot mechanisms. The suitability of these encoders for safety-related applications also makes it possible to implement human-robot collaboration systems.